February 25, 2011 in "costa rica", "rainforest", "vision"
I am a carpool of one and live with the guilt of burning fuel on my twenty-two mile trek to and from work each day. Lacking a partner with the flexibility to adapt to my unpredictable work schedule, I carpool with National Public Radio. During this morning's commute the local climatologist offered the radio audience his word of the day... "green-out." There was a pregnant pause between his words and the definition that followed. Green-out... I thought to myself... what could this mean? Was a green-out an ugly temperature inversion that occurs during the depths of winter? No,... I've never seen a green inversion. Seconds later Mark Seeley offered the inspiration that I was seeking on this morning. Green-out... the first green foliage exposed following an arctic thaw. I thought to myself,... I want to trade the current white-out for a green-out. I want to see the green grass exposed beneath the melting snow. I want to shed the winter blues for summer greens. Today's post is Inspiration #1... 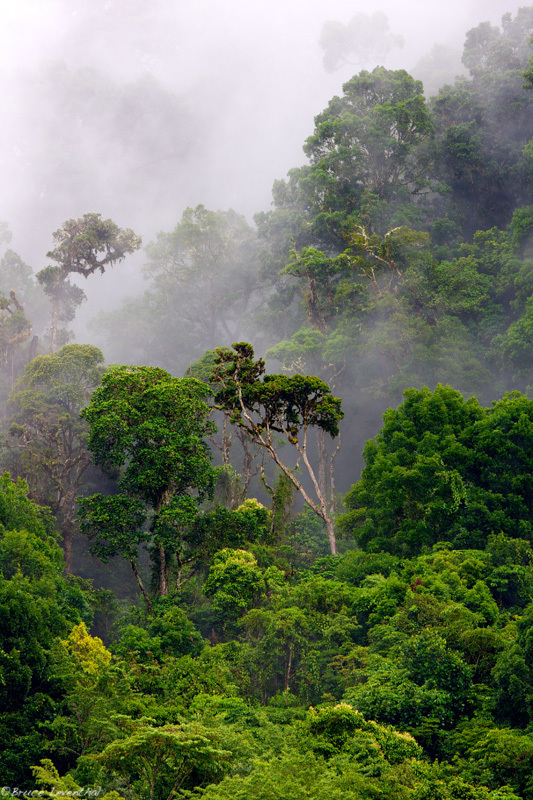 The Cloud Forest of Savegre River. As a direct challenge to "Old-Man Winter," I will post nothing but green for the next seven days... I may continue to shoot the white and sterile landscape this winter, but I will dig deep in my memories and remind myself that spring is on its way.